Intelligent. Impatient. Addicted to the game of creating wealth for others. Billionaire mining entrepreneur Ross Beaty has built one successful resource company after another. The Vancouver geologist formed Lumina Copper in the early 2000s to acquire and develop copper projects. Early investors there were rewarded with staggering returns of over 8000% (Full story). Beaty created Pan American Silver, one of the world’s largest silver producers. He’s backed countless other successful mining startups including Ventana Gold and Augusta Resource Corp. in a big way. In 2009, Beaty turned his sights to renewable energy, and built Alterra Power into a successful producer that was acquired for $1.1 billion last year. There is lot of room for organic growth at both Aurizona and Castle Mountain, but we are also committed to growth through mergers & acquisitions. Goldfinger: What is the expansion potential at Aurizona? Ross Beaty: Aurizona is a really big deposit. You would call it a gold camp which means that there are a series of veins that extend deep into the earth and they are very extensive laterally. Only one part of the project has been explored to date and that is the part of the project we are building a mine on. This part of the property only represents a small portion of the total property package. We expect the open pit portion that we are building now will be in operation for many decades. In addition, we expect to explore the underground potential at the project because these structures that come up to surface extend as far as 600 meters below surface. I expect these veins to form the foundation for a long lived underground mining operation. These expansion plans will be developed over the next few years and they will be funded by a combination of external sources as well as internal cash flow. Goldfinger: Turning to Castle Mountain, this project seems to be where the real upside in Equinox shares exists as it seems that the market has given Equinox credit for Aurizona. What hurdles do you still need to leap over with Castle Mountain in order for the market to revalue Equinox shares higher? Ross Beaty: Well let me just say this, the market has given us full credit for the existing resource at Aurizona, however, the market hasn’t given us any credit for expansions beyond the current life of the mine and any underground exploration. We will demonstrate that those are viable and add significant upside to Equinox shares. Turning to Castle Mountain I agree there is a discount currently because we don’t have all of our permits and we don’t have all the water that we need to operate a full scale heap leach operation that will produce about 200,000 ounces of gold per year. We are working hard on those and we don’t see any major obstacles. In California we have to go through the process and it is quite extensive, but we expect to have permits to facilitate the large scale operation by some time in 2020 or 2021, with production starting 2H 2021 or 1H 2022. Once full scale production starts it will quadruple the 50,000 ounces that we expect to have by the end of next year. Castle Mountain could deliver big upside once it moves into production but I wouldn’t discount Aurizona from delivering happy surprises if it’s the deposit that I think it is. Goldfinger: With Castle Mountain can you give a little more insight into the permitting process you guys are in the process of in California? Also, how does the Trump administration play into permitting on a federal level? Is there a risk that a Trump loss in 2020 could adversely affect the chances for Castle Mountain getting its final federal permits? Ross Beaty: Mining in California has a very long tradition. There’s nothing special about permitting a gold mine in California, I’ve permitted three mines in California with previous companies and I’ve operated a large gold mine in Southern California just south of Castle Mountain. You’ve just got to go through the hoops and follow the rules. The process just takes time and there’s no doubt that Trump’s group of regulators are more friendly to private investors than a democrat administration might be. Regardless of the administration in power, you just have to follow the rules and we plan to do that. Goldfinger: Equinox has spun out its copper assets into a spinco called Solaris Copper which Equinox shareholders have now received in their brokerage accounts. We’ve seen about a 20% spike in Equinox shares in the last week, to what do you attribute this spike? Ross Beaty: It’s hard to say what moves the market in the short term, in fact I don’t even look at that. I’m focused on long term wealth creation for shareholders and the way you do that is by finding more gold, developing new gold deposits, expanding production, etc. Over the long term we expect Equinox to outperform due to our extremely strong management team and strong assets. We intend to keep our heads down and develop our assets and we should to do very well regardless of the gold price. Obviously, if the gold price rises Equinox shares will do even better but we don’t need to see a rising gold price to still do very well for shareholders. Goldfinger: How much cash does Equinox have on its balance sheet and will there be any need to raise additional capital this year? Ross Beaty: We’re fully funded for what we’re doing now; we’re doing exploration work at Aurizona, we’re building the mine at Aurizona, and we’re doing the feasibility study at Castle Mountain. If we need to step up any of these plans then we might require additional funding. Also, if we decide to acquire additional projects or begin phase 1 mine construction at Castle Mountain then we would need to raise additional funds. So yes, I would expect that we will be doing an equity financing in the next 12 months, however, I expect that it will be at higher prices and that it will be on a very accretive basis for shareholders. Goldfinger: Equinox also has a couple of other smaller gold projects, what are your plans with those? Ross Beaty: We inherited a couple of small gold projects that we call non-core projects. You can’t build a big company by developing small assets so we’re going to sell those projects and in fact we’ve already sold one (Koricancha Project in Peru). We are focused on big assets that will deliver big returns for our shareholders. Goldfinger: The mining sector is now in a buyers market and Equinox is looking to make a big acquisition, can you tell us a little about where you are looking and if any assets are really on your radar right now considering the downturn in the sector? Ross Beaty: You’re right, it is a buyer’s market. You have this peculiar disconnect between the gold price (which has done pretty well over the last couple of years) and gold equities (which have performed poorly). Gold equities have underperformed the gold price which means that there is much better value to try to roll-up some of these assets into a single bigger, stronger company that offers scale and better liquidity for shareholders. We’re trying to be disciplined buyers, we haven’t done anything year-to-date even though we’ve made three offers to combine our company with other producing gold assets. I believe we will be able to make a large acquisition before the end of this year, however, these things are more easily said than done. Goldfinger: Where is Equinox looking geographically? Ross Beaty: I like the Americas, I know the region very well and I’ve worked in almost every country there. The management team at Equinox is also extremely experienced in West Africa so we are looking at opportunities there. We really want to stick with where we know and where we feel we have some strategic advantage. Goldfinger: Turning to the mining sector overall, we’ve seen some M&A so far this year but it sort of feels like the sell-off since June may have put a damper on whatever M&A plans that may have been in the works. What’s your feel in terms of M&A? Do you think that we will see some more big deals (such as South 32’s all cash acquisition of Arizona Mining) this year or do you think it will be limited to strategic deals such as mergers of equals or smaller all-stock deals like we saw with Coeur and Northern Empire? Ross Beaty: We’ve had some activity in terms of M&A in the mining space but I feel like it’s been at about the same rate it’s been at for the last couple of years. I think it will continue at about the same pace and it will be driven by necessity. Mines by their nature are depleting assets and larger companies need to acquire smaller exploration & development companies who have made real discoveries in order to replace their dwindling reserves. This will continue to happen whether we have strong metals prices or weak metals prices. In some markets when producers have stronger cash flow or when juniors have higher share prices, M&A activity tends to be greater. Equinox is more likely to be a buyer than a seller in this market, and we’re certainly not trying to build a company to set ourselves up for sale. We are trying to build a very large gold producer that will rank highly among the mid-tiers or possibly even higher. Goldfinger: Is your goal with Equinox to take it to the point where it can be sold to a major at a nice premium OR is this a company that’s going to stand on its own and generate strong cash flow for a long time to come? Ross Beaty: 100% the latter. We are trying to build long term value and ultimately become a household name in the gold mining sector. Goldfinger: I’m curious, and I’m sure many readers are as well. Do you follow news from small exploration companies? For example, we’ve had some big high-grade holes drilled by a couple of gold explorers in recent weeks, do you follow Sokoman Iron (TSX-V:SIC) and/or Aben Resources (TSX-V:ABN)? Ross Beaty: Those companies are too small, they don’t hit our radar at all. Goldfinger: What are you monitoring on a daily basis? What are you looking at in order to find your next acquisition? Ross Beaty: All we’re looking at are, operating mines. An operating mine would bolt on very well to the two world class development assets that we already have. We’re also only looking at large projects (more than 100,000 ounces of gold per year in production). There’s a certain size, location, risk envelope that we’re focused on. You can also never be too rigorous, you’ve got to be very opportunistic in this situation but I would also say we’re quite restricted in terms of what we’re looking for. Goldfinger: Can you give us any more insights into what you’re looking at in terms of acquisitions? Ross Beaty: (laughs) Well, when you’re looking at a producing mine you’re looking at something that is much less risky usually but also less potential return. Generally speaking we are looking for a producing mine in the 100,000-200,000 ounce range that is operating in a jurisdiction that we know and we like, a mine that is generating reasonable cash flows and has a reasonable mine life, with good exploration upside. Beyond that I can’t get more specific. Goldfinger: Can you tell readers what brought you to this point in your career? What was your first big win as a mining investor and how did you get to this point where you’re at now as Chairman of Equinox Gold? Ross Beaty: I’m a geologist from Vancouver. I always wanted to work outdoors so I became a geologist. I quickly realized I was never going to become a good employee because I was too interested in doing my own thing so I went off and started my first company in 1995 interestingly called Equinox Resources, a public gold mining company. Eventually I received an offer I couldn’t turn down to sell the company, so then I started a 2nd company which became Pan American Silver which has been a big success. I’m skipping through about 8 or 9 smaller exploration companies that I started which all set themselves up to be acquired by larger companies and were in fact all sold over a 10 – 15 year period. I’ve had a very enjoyable, successful career working with great people. I’ve been lucky with timing, lucky with discoveries, but it all starts with working with great people and setting out to create value for shareholders. All of this has set me up to do it again with Equinox Gold and as I said earlier I think this will be my last deal, and I think it will be my biggest yet and hopefully do it in a shorter time period. We’re literally eight months into the game right now, so we’re at the starting gates, and lets see how we do. So far so good. Goldfinger: From my vantage point it’s actually a really nice spot for Equinox, both from the story of the individual company perspective but also from a sector cyclical perspective in the gold mining sector. As a long term investor you want to be a buyer of quality companies when their sector is out of favor and Equinox would be a perfect example of this sort of a setup. Ross Beaty: I would agree with that. People often forget that mining is a cyclical business, and when you have a time like this where mining companies are out of favor everyone thinks it’s going to last forever but it doesn’t. It’s cyclical. The biggest money is always made from buying near the low-point of the cycle and selling near the high part of the cycle. Nobody can time it perfectly but we know for certain that we’re definitely not at the high right now, and there’s a very good chance that we’re very close to the low. Quite frankly I believe that we’re in a long term secular bull market for gold and we’re simply experiencing a shorter term cyclical correction. I believe the long term gold price will exceed the previous high made in 2011 and that was US$1800/ounce, and when that happens any investor buying Equinox Gold or any other quality gold miner is going to do very very well. Goldfinger: In the metals mining sector there are two main ways to approach it from an investment perspective, there’s the macro perspective and the micro perspective. From your experience as a legendary investor in the sector how much does the macro matter relative to the micro? Ross Beaty: They’re both very important. For example, even if you have a declining gold price (a less positive macro environment) you can still do well if you pick the right company that has the right assets with exploration upside. A good example of that today is Pan American Silver (Nasdaq:PAAS, TSX:PAAS) which reported a really fabulous quarter and even though silver is down the stock is up 10% today. So if you get the micro right you’re going to do ok, however, the real money comes when the cycle turns from a bear market to a bull market and there’s a flood of new money into the sector. That’s when everybody does well, but even in that bull market environment you’re going to see superior performance from the better run, higher quality companies. Goldfinger: If you think back over the last few decades and think about other times when the mining sector was out of favor, how does this current market feel compared to other cyclical lows such as 2001, 2008, 2015? Does it feel like we’re in a tremendous buying opportunity or just a pretty good one? Ross Beaty: I’d say it’s a pretty good buying opportunity, not tremendous. There’s been some capitulation among some funds, but you’ve got to realize that gold could crash below US$1,000. I’m not saying that it will, but it’s possible. It’s as you said it, it’s a pretty good opportunity to invest in this sector but I wouldn’t say it’s a time to buy everything in sight. Goldfinger: What would need to happen for you to say this is a buying opportunity of a lifetime? Something like December 2008 or December 2015? Ross Beaty: Well, the conditions that prevailed during both of those times you mentioned would be ideal. The conditions we saw in November/December 2008 were incredible, you could have basically bought anything and you would have done extremely well. Then in late-2015 when nobody wanted to hear the word “gold” and gold was barely trading over US$1000/ounce, then a few months later gold was up to US$1300. From December 2015 to April/May 2016 every single gold equity tripled or quadrupled, it was just a wonderful time to buy. Goldfinger: Can a retail investor who doesn’t have any special expertise in mining and who can’t participate in private placements (because they don’t have accredited investor status) do well in the junior mining/mining sector? What advice would you give them? Ross Beaty: I would say it’s not that easy for them to make money in the space, unless they get their timing right. If they get the timing (macro) right then they’ll do really well. If they want to do the work and research the companies in-depth and listen to really good advisors (investment advisors or newsletter writers) then they have a much better chance of doing well even in a crummy gold market. Most people aren’t really prepared to put in the time and do the work to really research companies and there are a lot of crappy companies in the space, it really is a minefield for investors. There are a lot of companies who aren’t looking to build long term value for shareholders, all they want to do is crank the share price up in the short term and sell out. It’s always been like that and it will always be like that, but there will also always be opportunity for investors who are willing to put in the work necessary (attend conferences, speak with management, read company filings, etc.) to find the gems hidden among the riff raff. Goldfinger: There’s been a lot of conversation recently about the accredited investor rules both in Canada and the US, and about how these rules are unfair because they prevent the little guys from participating in the best deals. What do you think about this and do you think we should see a change in the rules to allow smaller investors to participate in private placements somehow? Ross Beaty: The world isn’t fair. There’s a lot of inequality in the world, the rich are getting richer and the poor are getting poorer and that’s simply how it is. It’s not helped by overzealous regulators who bend over backwards to protect the little guy and all they end up doing is screwing him. I don’t think you’re going to change the rules easily and while I’m very sympathetic I’m not hopeful that things are going to change. Goldfinger: How important is insider buying and selling to you? Sometimes when we see a large investor like yourself or Eric Sprott buying shares in a company it can create quite a rush into the stock? Is this something that you look at closely? 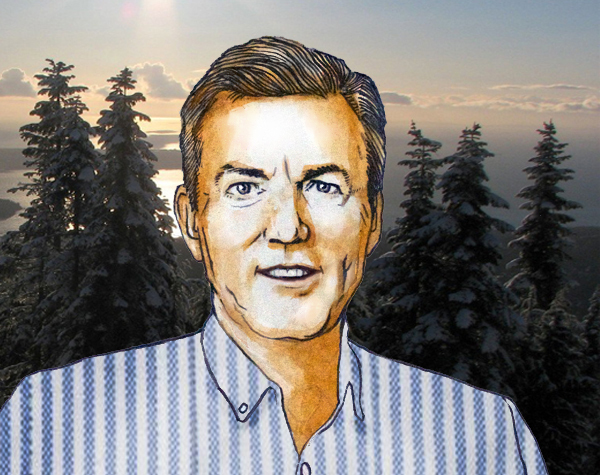 Ross Beaty: Well, when a smart investor like Eric Sprott buys into a company it quite rightly creates a lot of follow-on investors because he has a record of more wins than losses. Insider buying is a very important metric of how large investors think and how management thinks, so it is important. It’s something that should be kept in mind when looking at a company. Insider selling is a red flag but sometimes management has to sell some stock and it can be explained innocently by their particular personal situation. However, insider selling surely isn’t a good thing, generally speaking. Goldfinger: At what point in your career did you feel like you’d made it? When did you feel that you had figured out your niche and your edge to be a successful investor and to become wealthy? Ross Beaty: I don’t do this for the money, I do it because it’s fun and I like building companies and creating wealth for people. Money is just a way of keeping score, I give all my money away to charity anyway, I don’t want to die with it. Money doesn’t drive me, what drives me is the joy of making a new discovery and taking a new idea and building a big company. What drives me is creating wealth for communities, employees, governments and shareholders. And I’ve done it so many times that it’s become an addiction to be honest. Goldfinger: You’re giving away all of your money before you die? Ross Beaty: Yes, I have an environmental foundation set up to protect nature and the environment. I don’t spend much money, I simply enjoy making it and I enjoy giving it away. Goldfinger: Any other advice for individual investors? Ross Beaty: First of all don’t put all your eggs in one basket. Number two, look at management of companies very carefully and try to find investments in which management is invested in their deals and where management has a track record of wealth creation. Then broaden your scope to invest in half a dozen companies. I think if you invest in half a dozen companies and know these companies really well you will do well over the long run. Goldfinger: I think I know your answer to this question but i’m going to ask it anyway. What’s your favorite investment right now? Ross Beaty: I’ve put a lot of money into Equinox Gold so I’m going to have to say that Equinox Gold is my favorite investment right now. I’ve put C$40 million into it in the last eight months and quite frankly I would prefer to put in more money. I believe we are going to deliver outsized returns to shareholders whether or not we have an increasing gold price. And if the gold price rises then the returns will just be that much better. Goldfinger: Do you plan to buy more Equinox shares on the open market? Ross Beaty: I bought C$1 million worth of EQX shares on the open market just a couple of weeks ago, so I would buy them either on the open market or through a private placement. Yes, I plan to buy more Equinox Gold shares. Disclosure: Author is long EQX shares in a long term investment portfolio at the time of publishing this interview.